The Goat Lovers Gift Guide! As a self-proclaimed lover of all things goat 🙂 I thought I would list few gifts that I would love to see under my tree this year. I hope this Goat Lovers Gift Guide will inspire you to spoil that goat lover in your life! Storey’s Guide to Raising Goats This is by far my favorite book on goats. This book not only covers the basics like feed, housing, and breed descriptions but also goes into diseases, breeding, and birthing. Sure to please any goat owner new or seasoned. Love me a Goat T-Shirt! Nothing says I love you more than a funny goat loving T-shirt. There are so many out there that it was hard to choose just one for this guide, but here is my favorite! The Backyard Homestead Guide To Raising Farm Animals Yes, I know…not another book! But this is a GREAT book and should be on any goat lovers gift list. I find myself going back to this book again and again. Definitely, will not disappoint. Head Lamp This is such a lifesaver for me since I am always doing chores in the dark. These headlamps are easy to wear and convenient to have especially when your chores call for two hands! I prefer the clip on ones that attach to a baseball cap or a visor. Barn Boots Just like my headlamps you can never have too many pairs of rubber barn boots. Who says barn boots can’t be fun and cute? Find a pair of adorable boots and make your goat loving recipient smile this holiday! Hoof Trimmers As any goat owner knows, keeping hooves trimmed can save many a headache. I have many pairs of trimmers and this pair is good and a good price as well. Any goat lover will love to find a pair of these babies under their tree this year! Coffee!!! No goat lovers gift list would be complete without this awesome sauce coffee maker. I own one of these coffee makers and he (yes, it’s a he and his name is Charlie….don’t we all name our coffee pots??) is the reason I am able to function at the insane hours I do. This 14 cup beauty has all the bells and whistles and will be adored by anyone who finds him under their tree this year! 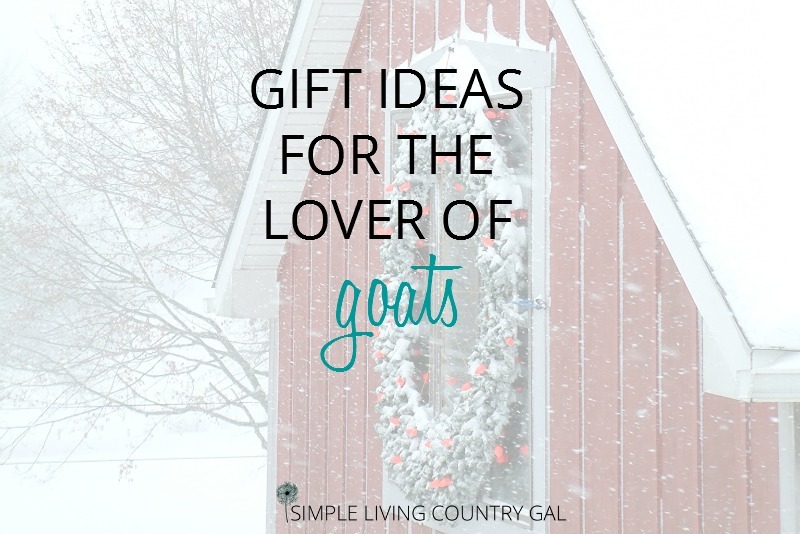 I hope this Goat Lovers Gift list helps to inspire you to find the perfect gift for your goat loving recipient this holiday season!